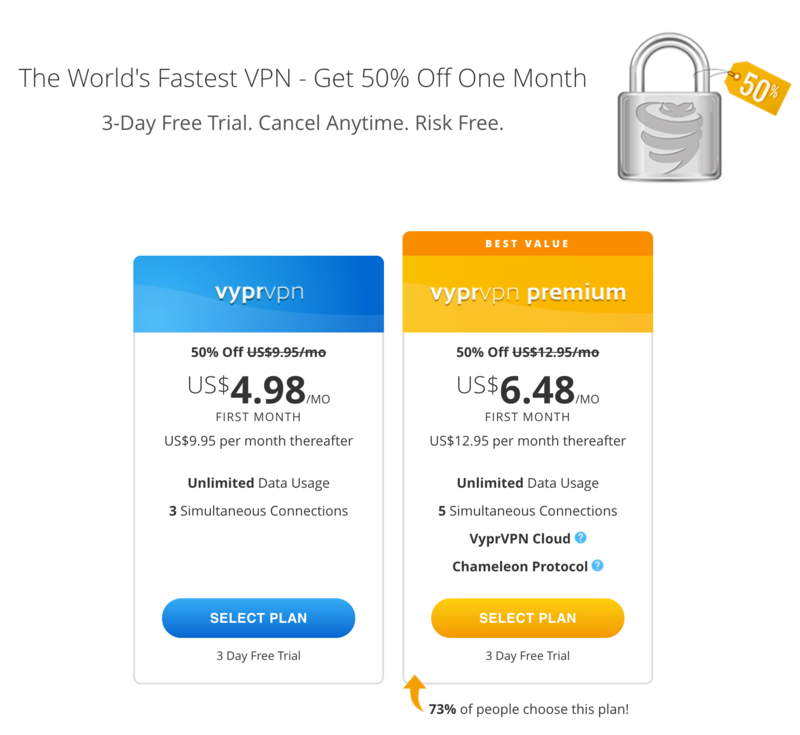 It’s not possible to get discount by using coupon code while buying any VyprVPN plan. Because there’s no coupon field in the checkout process where you can redeem the coupon in order to get discount. So what there’s no vyprvpn coupon available……We have some thing very special for you that’s special discount link. Currently 50% off deal is available for both plans. Are you looking for a safe, secure way to browse the web? Maybe you’ve read about all those privacy breaches which have occurred online, and now you’re concerned it might happen to you. One way to protect yourself is to use a VPN (virtual private network). While your antivirus keeps your computer from viruses, a VPN protects your privacy, and a good example of that is VyprVPN. VyprVPN comes with several powerful features which provide protection, and while it’s not perfect, the security features are of the high-end type. If you want to browse the web without being spied on, VyprVPN is a good option. Let’s take a look at what it has to offer in the following review. VyprVPN offers members Internet privacy whenever you go online. Depending on the package you choose, you can connect 3 or 5 devices at the same time (more on that in the Pricing section). If you choose the Premium package you’ll get access to its VyprVPN Cloud and Vypr Chameleon Protocol. The Vypr Chameleon Protocol is a 256-bit system which is designed to go around services and sites which try to block VPNs. The popularity and widespread use of VPNs have led to attempts to counter it, so this anti VPN blocking feature is welcome. This is the type of control which comes in handy when you’re in a country with strict Internet controls. The Vypr Cloud (formerly known as VyprVPN Server) is a special feature designed to give you additional security layers when you use VirtualBox, DigitalOcean, Amazon Web Box and other cloud services. VyprVPN provides support for OpenVPN, L2TP/Ipsec and PPTP regardless of the price tier you choose. However, the Chameleon is only available with the Premium package. VyprVPN supports Windows, the Mac OS, iOS and Android: Mac and Windows can utilize any of the four protocols, while the iOS uses Ipsec. Android platforms meanwhile use the Chameleon or OpenVPN. VyprVPN has its own iOS app and it runs just fine, but if you want to use OpenVPN, just download the app and input your VyprVPN credentials and it’s ready for use. Once the app is installed you can use OpenVPN to connect to VyprVPN. All VyprVPN members get the NAT (Network Address Translation) Firewall which prevents unwanted inbound traffic from getting in. This firewall is especially good at blocking bots which attempt to exploit open ports. Practically all routers today use NAT for sharing web connections across devices, so the devices get IP addresses which are local only and can only be seen within the network. VyprVPN also provides protection for your DNS and that’s another good feature because some attackers use DNS to attack websites and users. The protection level provided here is among the highest in its class. The VyprVPN has a kill switch feature which you can set up to stop all web traffic if your connection to VyprVPN is cut off. A kill witch is a common feature but the implementation is better here. With this, you get assurance your security is not compromised. You can access the kill switch feature in the settings, and there’s also an option to activate VyprVPN automatically if you are on a non-secure Wi-Fi network. You can also compile a database of trusted networks where VyprVPN may not be required. This is a very useful feature because it means you don’t have to remember to turn it off. The settings also provide you with a lot of options for changing the functions of VyprVPN. Casual users don’t need to mess around with these as the default works fine, but if you like to tinker with these, the options are right here. VyprVPN has a lot of features, but it’s not going to be a problem. For most users, it’s just about installing the client and start browsing. Even so it’s good to know VyprVPN has advanced settings available. VyprVPN offers more than 700 servers around the world. Its server locations can be found throughout Europe, South America, North America, the Middle East, Central America, Asia, and Africa. Other VPNs usually don’t have server locations in Africa and the Middle East but VyprVPN does, a solid indication of their dedication. Even more interesting is the company has servers in Russia, China, and Turkey, countries with strict Internet laws. They also provide more than 200,000 IP addresses and you can quickly switch from one service to another. Once you’re connected to the system, VyprVPN chooses the fastest server based on your location for optimum performance. Choosing a server is easy, but it does open another window. Another window opens when you alter a setting. This is a minor annoyance though and has no effect on performance. The company is based in Switzerland since the country does not have any laws which require data retention. However, its servers have been scattered around the world to provide the best possible performance. Performance is reliable overall, including the free 3-day trial. Regardless which price tier you avail of, performance is consistent and it does not limit or throttle your Internet connection. It’s also good to note that VyprVPN does not put advertisements in web user traffic as that has potential security risks. VyprVPN results are consistent across the iOS, Android, Mac and Windows, and you can also attach an APK and use VyprVPN on Android TVs. If you want to provide protection for your router you can use the VyprVPN app for Tomato MIPS/ARM routers. This not only improves performance but also provides extra protection. This allows you to have a VPN to protect your router and all the devices which are connected to it. The VyprVPN installation is quick and easy. It runs seamlessly on Windows 10 systems and you’ll be ready to go in a few minutes. After installation, VyprVPN provides you with a window displaying the time connected, the IP address you’re using and connection status. As you use the device you’re going to see the protocol utilized for connection encryption (OpenVPN is the default but you can change it). At any time you can see your firewall status, and there is a graph displaying the network’s performance. The Connect button is large and impossible to miss, and you’ll also be using this for choosing a server. The interface is well-designed but isn’t overbearing. While the interface may not seem to have a lot to do with performance per se, it actually does. A poorly designed interface for one thing, is going to make it difficult for you to focus on browsing. While VyprVPN offers a few technical options, they’re easy to understand and enhance your browsing experience without compromising security and privacy. It’s also good to see there is a lenient policy for BitTorrent and P2P users. P2P use is a mixed bag for a lot of VPN services, so it’s good to see there’s consistent support here. 700 plus servers does not seem like a lot when compared to others, but what gives VyprVPN the edge is the reliability of their servers. They are well maintained and spread throughout, and you don’t get as many overcrowded servers like on other VPNs. The servers are quick and don’t result in performance degradation as usually happens on other VPNs. Web browsing, download and upload speeds are among the best especially when compared to other VPNs. Networks that run on VPNs are usually slower due to the longer route. For the most part however, there is little speed slowdown and in some cases upload speed is actually improved. With or without VPN, network speed and performance can change though. A lot of variables come into play and you have to take all of them into account. Sometimes the problem could be due to the website you’re visiting and not the network itself. But if the connection is slow you can always change servers. What it comes down to is this: VyprVPN may not have thousands of servers, but these ones they have are specially selected and provide consistent performance. VyprVPN excels in the security and privacy fronts, and it is not surprising given its comprehensive feature set. Once you are on the system, every packet in your network traffic is transmitted in its tunnel. This VPN tunnel is encrypted for protection so the data moving between the VyprVPN and your computer is secure. In tests, websites which attempt to track your IP address will only see VyprVPN’s IP address. The service also does an outstanding job of hiding your web traffic from your ISP. This is a very useful feature because there are countries which allow Internet service providers to sell user metadata to 3rd parties. By using the VyprVPN service, you’ll be assured your privacy won’t be compromised when you use a public Wi-Fi service. The robust security service also provides assurance your identity won’t be compromised. The VyprVPN security system is such that it’s the type used by journalists and activists to overcome censorship in some countries. Note: VyprVPN does log your IP address and the IP address of the VPN you connected to. This data is kept for 30 days for billing, service offers, troubleshooting and other issues. Your start and stop time as well as bytes used are also temporarily stored for the same reasons above. However, VyprVPN does not log your content or traffic, and it doesn’t do any traffic packet inspection unless you ask for it. No shallow packet inspection is done either. In short, no personal information is stored, and whatever is stored is removed after 30 days anyway. 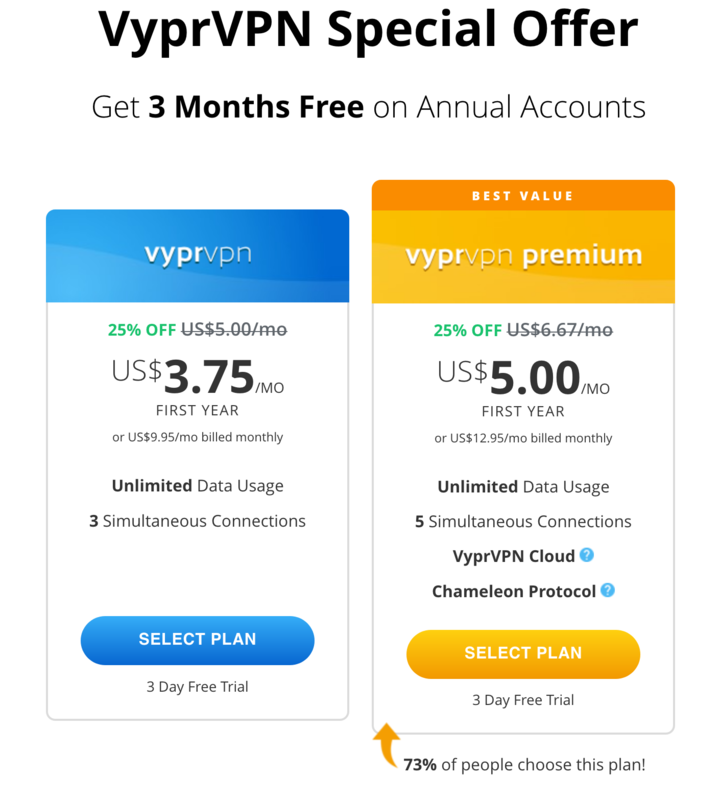 VyprVPN used to have three pricing levels, but they have replaced it with two, VyprVPN and VyprVPN Premium. VyprVPN costs $9.95 a month. VyprVPN Premium costs $12.95 a month. Both packages have a free 3-day trial so you will be able to assess the service quality before committing to it. The VyprVPN plan allows three connections at the same time while the premium package allows up to 5 simultaneous connections. VyprVPN also provides VyprVPN Free (not to be confused with the 3 day trial offer). It is free and you can download it for your mobile or desktop. With the free account you can connect two devices at the same time and use the protocols described earlier. You also get the NAT Firewall, DNS security protection as well as Chameleon. The catch is the data is limited to only 1 GB, and you need to pay to continue using VyprVPN. While it’s limited, you can just think of this as a trial run. As has been pointed out here, the security, privacy, and performance aspects are all solid and better than mos other VPNs. NAT firewall provides extra security. Only has support for 3 devices. Customer support is solid: the official website contains several links for resolving common problems, and you can also access manual setup instructions, FAQs, troubleshooting and account management. There are also links to its legal documents and tips for using the web in China, which is known for its restrictive controls. It’s a good idea to check these resources before contacting support. But if you do need to get in touch, they’re available 24/7. The market is filled with a lot of VPN services, and that is understandable given their importance for both the home and business user. With the threat of online attackers and privacy issues ever present, it’s incumbent on your part to get a quality VPN service. After reviewing VyprVPN, it’s safe to say this is one of the best. Its pricing structure and performance makes it worth a look, and its security package is one of the stronger ones you will find today. When you combine these tools with its diverse servers and quick installation, and you have a high quality and reliable VPN.